Am happy to design my menu with the veggies and ingredients given by Harini, here comes my menu..
Wash and cook the channadal with chopped raw mango pieces and turmeric powder in pressure cooker upto 3 hisses, once the stem get released mash the cooked dal and mango pieces well. Heat enough oil in a kadai,let splutters the mustard seeds,urad dal and asafoetida powder, add immediately the chopped onions,chopped tomatoes and saute until the veggies get cooked. Meanwhile grind the grated coconut with cumin seeds as fine paste..
Now add the methi leaves, cook for few minutes until the greens gets shrinks...add the cooked dal-mango mixture,sambhar powder to the greens,bring everything to boil. Add the already grounded paste to the cooking gravy,cook for few minutes and put off the stove.. Serve hot with rice or either with idlis. I could have never thought of this combination but it would be super aromatic and tasty. well done Priya. Can imagine the flavour.Splendid one ! Its a gr8 combo..Love the color.. I can imagine how good the combination would have been..looks sooper. Great combo and looks really tasty! Mango n methi new combo....brilliant idea....this tempting me a lot...I have both in hand I am goin to try this today :) thanx priya for sharing your innovative recipes!!! Just reading all the ingredients makes me hungry for this- what a combo! Delicious combo and a very interesting menu. Sounds fabulous! 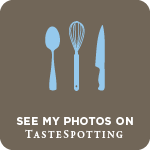 You never stop amazing us with your innovative combinations of various ingredients..Thank you so much for sending it to our event. Great combination of spices. I know I will love this. 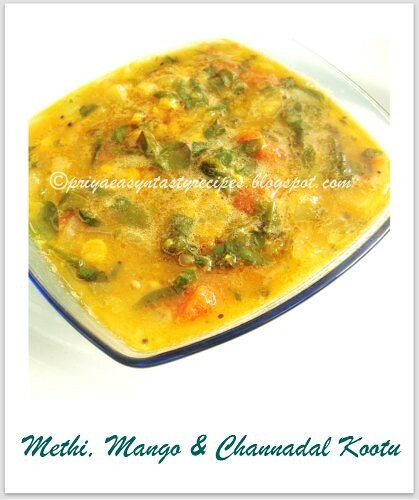 Methi mango chanadal kootu looks awesome delicious. Lovely color and great combo!! Super yummy!!! Aromatic and healthy too!! I wouldn't have conjured up this combination - looks fabulous! thank you priya..i tried n i liked it very much...breakfast with dosa super O Super...thanx..
looking delicious n healthy too.. This is a perfect looking and healthy kootu.. love your menu! That does look like an unusual combo, love the color and flavors in there. Mango should work well with methi I guess- I would love to taste this one! Lovely sambhar with the unusual fusion. so new combo! would be great with warm rice!